BARK bar and cafe in Subiaco celebrates its first birthday this month. Owner Mitchell Jenkin set up shop along Hay Street in March 2018 offering West Australian dcor, coffee, wines, beers and gins. “My first year of business has gone better than expected, considering how tough hospitality is in Subiaco,” he said. The Subiaco resident was working as an engineer before opening Subiaco’s smallest bar, which functions as a caf during the day and bar at night from Tuesday to Saturday. “The place feels like an old lounge room – the wines, the gins, and the beers are all WA products, and the reasoning for this is that we wanted something welcoming and friendly,” Mr Jenkins said. “Our regulars come in and you know their name and their drink – it’s great it’s got that friendly vibe and some people say to us they feel like Bark is a welcoming, safe space”. Mr Jenkins said Bark offered coffee and jaffles during the day and simple food, like cheeseboards in the evening. “You can also BYO food like Uber Eats or food from next door – we are so small and limited in our kitchen so we have that offering of people who can get there own food while having a beer and chilling out,” he said. 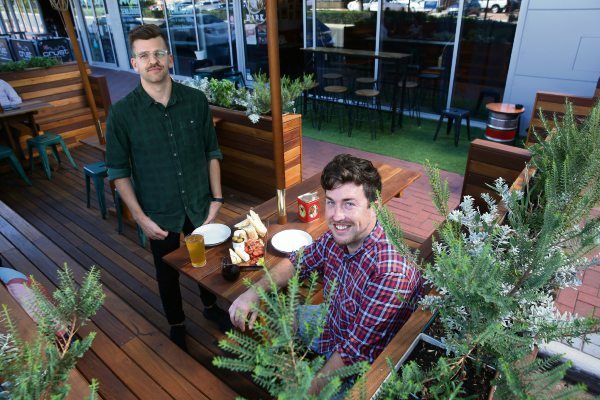 Bark was awarded a Small Business grant issued by the City of Subiaco in December last year which helped Mr Jenkins build and develop alfresco decking. “The council had a grant open and we applied for that and it partially funded about 40 per cent of the decking,” he said. Mr Jenkins said the funding from council had taken off some stress and assisted his business in gaining even more exposure. Bark is located along Hay Street in Subiaco. For more information go to https://bit.ly/2UISquP.